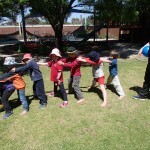 Outside we have been learning how to play Tunnel Ball and throwing and catching balls. Tunnel ball requires great concentration and co-operation among players. 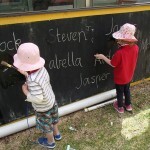 We have also been painting over our names (written in chalk) with water on the chalkboard and had a few sneaky water fights! 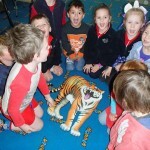 The children have been having fun with Miss Jayne and the Giant Floor Puzzles. 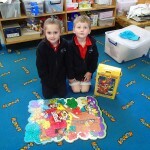 They have been learning puzzle strategies like looking for corner and edge pieces first. 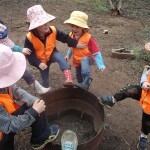 A visit from the Fire Chief to Pre School sparked a new round of pretend ‘fire’ play. 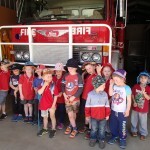 On our way back from the hospital we visited the fire shed and saw the Fire Truck and the SES truck. WE also heard the siren! 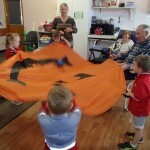 A visit to the hospital is always popular with the children and the Residents. We have made it a monthly event in our program this year. 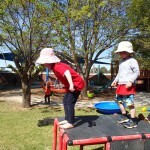 This week we took along some active games. First we had the small parachute and a soft ball. 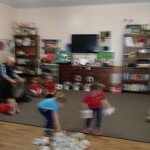 The children were able to stand around and the Residents were able to access the game by sitting. Then we played “Steal the Egg”. The children had to run into the centre and steal the eggs one at a time and take it back to their team leader (a Resident) for collection. 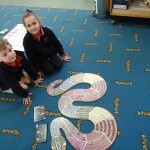 Then we all counted each collection to see who had the most. 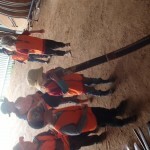 The last game we played, the children had to roll a dice and collect the number shown of unifix to their team leader (a resident) who put them all into a stick and we measured who had the most. 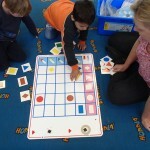 LOGICA is a game we use to help children sort cards with two or three attributes into a logical grid pattern. 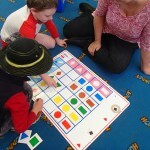 This children enjoy playing and carefully watch their friends to see if they have the cards in the correct space. 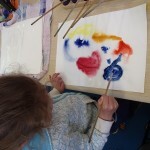 We have been experimenting with watercolour paints on wet paper this term. 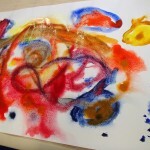 It is beautiful to watch the colours blend and mix on the speciality paper. 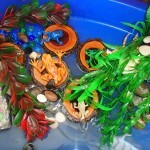 This term we have been exploring the lifecycle of Frogs in our World Tray. 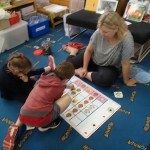 The children have been shown a poster of the lifecyle and we have also read some non-fiction books on the topic. 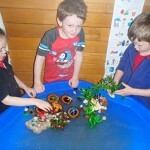 Non-fiction books are particularly popular with the boys in the group. 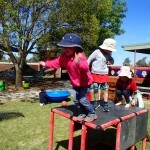 Jumping from our climbing frame onto gym mats has been a favourite activity of Pre Schoolers for some years now. 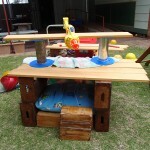 We use this activity to help the children who are timid in trying activities outside to have a go. 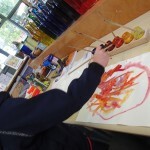 When they can do this without holding a teachers hand they feel such a sense of pride and this gives them the confidence to have a go at some other activities that will really stretch them and continue development of their Gross Motor Skills. 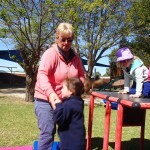 After the holidays we came back to Pre School to new garden beds (Thanks Donna!) We planted some vegetable in one and some flowers and herbs in another. Now we just have to keep them watered and hopefully we will have some food to eat before Christmas. 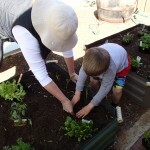 Learning how to grow food, and indeed, that food does grow (not just from the supermarket!) is an important life skill. 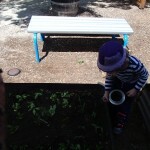 Growing our own food might even encourage children to taste food they never have before. 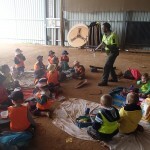 The Nyah West Pre School children came to Bush Kinder this week. We showed them our site and the fun things we do. 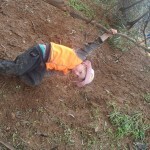 We showed them our cubbys, our sliding hills and our climbing trees. Willie Hannah (Koorie Educator) came to visit. 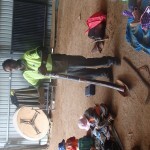 He talked to everyone about his culture and we took turns at using the tools and weapons. 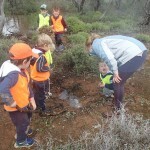 We also went for a big bush walk. 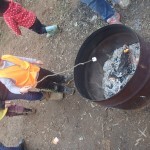 The children all enjoyed finding sticks to make a fire and then cooking their marshmallows. We made new friends with others. 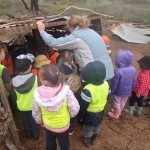 Today the weather was wet on and off and we had to keep running for the shed. We got very wet and muddy.